This is the review for lesson plan 5. Illuminated Quran: The Food. This surah speaks about permitted and forbidden foods. I asked my son which foods we are allowed to eat and which foods are forbidden. He said that we are not allowed to eat pig or other haram things but we are allowed to eat chicken and vegetables. If you would like more ideas for teaching your children about this subject please see out post Haram and Halal. I asked my son if there were any stories we knew of where forbidden food was mentioned. We discussed the story of Adam (a) and the wheat tree or apple tree in Paradise. My son wanted to know why we cannot eat from that tree. I told him that if Allah (s) says not to eat it that it must be bad for us. He asked if we can ask for apples in Jenna. I said I did not know but that there are many fruits there and maybe there are apples that are permitted there as well. If you would like to read more about the story of Prophet Adam (a) there is a chapter about him in My Little Lore of Light by Hajjah Amina Adil. The story of Prophet Adam (a) is also part of our Tree of Prophets project and the post concerning him can be found at this link: Tree of Prophets: Adam (a). Please see our new chapter concerning Adam (a) in The Tree of Light: The Lives of the Prophets for Young Muslims Vol. 1 for more details about his story and other samples. This surah speaks about wudu or ablution. I asked my son what wudu is. He said it is washing yourself to pray or eat and that we should say bissmillah before eating. I asked why we make wudu to pray and he said that if we are dirty when we pray that Allah (s) would not like that. This surah mentions the miracle where Prophet Isa (a) created the bat for clay. I asked my son where bats come from. First he said they come from a cave. Then he said that Prophet Isa (a) made the bat and then went to live in a cave. This surah speaks about the event where Prophet Isa (a) asked for the miracle of the table. I asked my son what he could remember about this event and he said that everyone ate from the table and some people believed and some did not. He asked what happened to the people who did not believe and I told him that they turned in to pigs. I asked him what he would think if a table came down from heaven. He said that he would definitely believe. Then he asked if the Christians ate the pig people and a said I did not know but I did not think so. If you would like to read more about Prophet Isa (a) to your children there is a chapter about him in My Little Lore of Light by Hajjah Amina Adil. The story of Prophet Isa (a) is also part of our Tree of Prophets series and the post concerning him can be found at this link: Tree of Prophets: Isa (a). Please share your ideas for teaching the meaning of the Quran to children. 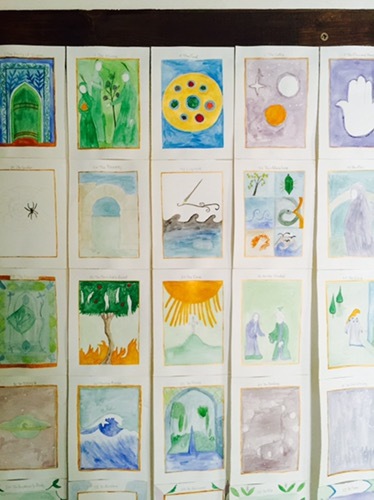 Please see our new book The Illuminated Quran: Curriculum for Children available now on Amazon and add to the discussion by sharing your lesson experiences and artwork the children make for each lesson.